Product information "Shimano XTR Di II Derailleur RD-M9050 GS"
Shimano's XTR M9050 Di2 shifting system brings the seamless control and instant response that only digital shifting can provide to the M9000 Rhythm Step drivetrain. This ushers in the digital age for mountain bikers, giving them control over their ride experience, no matter their discipline, like never before. Pairing Di2 with close gear steps means that shifting becomes a reflex. Decreased shift effort and superior ergonomics allow you to shift without decreasing your grip on the handlebar, keeping you in perfect control of both your bicycle and your effort. Your on-bike readiness will reach new heights with XTR Di2. As soon as the thought of a shift springs to mind, you can instantaneously react. The programmable, customizable, expandable E-tube Di2 platform brings a quantum leap in personalization to mountain biking. 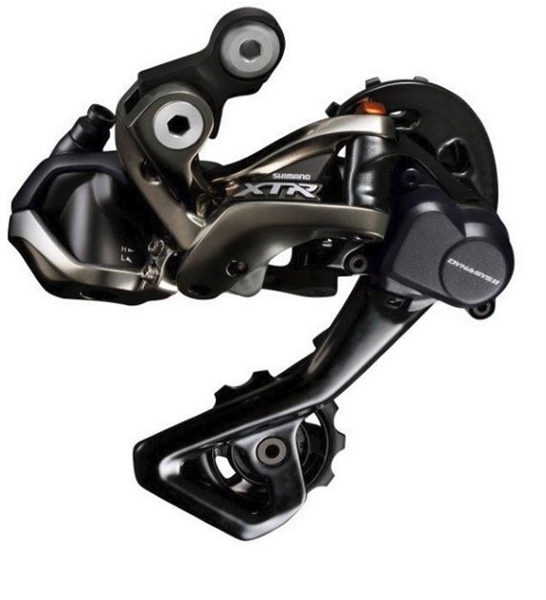 XTR Di2 is going to change the way you ride. How it changes is entirely up to you. The DURA-ACE 9070 and ULTEGRA 6870, XTR M9050 and ALFINE series have achieved a technological innovation of the computerized shifting system based on the Di2 concept with its new name, the SEIS (SHIMANO ELECTRONIC INTELLIGENT SYSTEM). The SEIS innovative shift technology is still based on the SHIMANO INDEX SYSTEM (SIS) that has proved its superior gear changing characteristics over the years. The big difference is that in this case, the shifting action is provided for by electronics instead of mechanics. This electronic shifting system has been extensively tested over past two years by several professional riders in all conditions possible, such as rain, mud, low temperatures, cobble stone roads and combinations of all of these at the same time. Shifting is executed by simply pressing the button. No power is needed to shift, which gives important advantages since it is easier now to always keep a tight grip on the handlebar and to keep your concentration on riding instead on shifting. The shift system allows accurate and effortless shifting in difficult circumstances like when you have cold hands or when you are completely exhausted. Furthermore, the shifting performance will never be affected by contaminated or stretched cables since the shifting signal is transferred electronically. The operating buttons work similarly to mechanical Dual Control Levers so you don't need to re-program your mind for a new system. Two derailleurs, One Shifter - Front derailleur reads the rear derailleur's position and automatically executes front shifts Improves efficiency by minimizing time spent on smaller chainwheels. Programmable synchronized shifting map - The rider chooses when front shifts occur and also chooses rear derailleur command. E-TUBE platform offers optimum flexibility on your bike. E-TUBE transmits interactive signals and power supply to each parts by "Plug & play" connection. E-TUBE is no rust, no stretch, no freeze and it ensures advanced low maintenance. And SM-PCE1 connects between PC and components to update firmware. Digital device stay the latest version with updating firmware for improve function. Related links to "Shimano XTR Di II Derailleur RD-M9050 GS"
Customer evaluation for "Shimano XTR Di II Derailleur RD-M9050 GS"